Flying Orange provides a variety of print and graphic design services including logos, marketing materials, business forms and t-shirt designs. Each piece is custom designed to client specifications or matched to existing materials. From concept to the final design, we ask for your input and opinions to complete the overall design. All graphics are designed with the Adobe suite of programs including Adobe Illustrator and Adobe PhotoShop. Print-ready files are provided to our clients via digital download and by CD as requested. Request a FREE No Obligation quote to determine the cost for your specific project. in one color or as an outline? in a small format such as a business card or sticker? in a larger format such as a sign or billboard? From the colors you choose to the images created, all pieces of the logo design may effect the various costs associated with the website and print design. Flying Orange will work with you to design the best logo for your identity and offer our experienced advice along the way. A new addition to the Flying Orange graphic design studio, we now design t-shirt graphics for printing by screen printers, online t-shirt companies and local shops. Our t-shirt graphics are provided in Vector (.EPS) format allowing for easy manipulation of color and scalability to the design. Our designs are perfect for non-profit organizations, sports teams, schools and businesses who may already have an apparel company, but would like more control and customization to the design on their t-shirt. 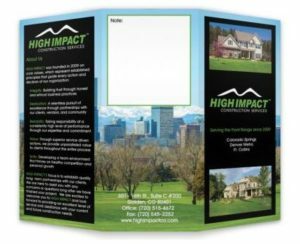 Marketing materials such as brochures, catalogs, postcards and other print media are the sales pitch to potential customers. They present your message, product or service offerings when you can’t do it verbally. They are your printable “sales pitch” to hand out, mail or have on hand for opportune moments. Let Flying Orange create your marketing materials, providing a high impact and professional design. We offer a variety of options for marketing materials at affordable rates for your business or organization. Request a FREE No Obligation quote to determine the cost for your specific project. Business forms are the simplest way of branding your image in the marketplace. Whether it be business correspondence on company letterhead or sharing your business card with a potential customer, your business forms will convey the professionalism of your company and the services you have to offer. All forms designed will match in overall look and feel. We offer a variety of options for designing business forms. Each form will be uniquely designed for printing, Adobe PDF for digital entry or template for programs such as Microsoft Word. Forms will be designed to print on standard page sizes and follow industry size standards. Our clients will be able to implement the new forms into their everyday routine affordably and easily. Request a FREE No Obligation quote to determine the cost for your specific business form project.